On Wednesday 4 May 2016, Catherine and Amy presented a new work, The Least of the Doorkeepers (It is Possible but Not at the Moment), during the exhibition opening of Borders, Barriers, Walls at MUMA, curated by Francis E. Parker. A pair of uniformed men moved two mobile razor wire fences around the gallery in a series of choreographed patterns, interrupting, blocking and rerouting the passage of visitors to the museum. The performance was devised by Catherine and Amy with assistance from choreographer, Ashley Dyer. The work was performed by Kieran Law and Arthur Bolkas, with support from Kyall Shanks and Tom Woodman. All photographs from the opening are by Zan Wimberley. 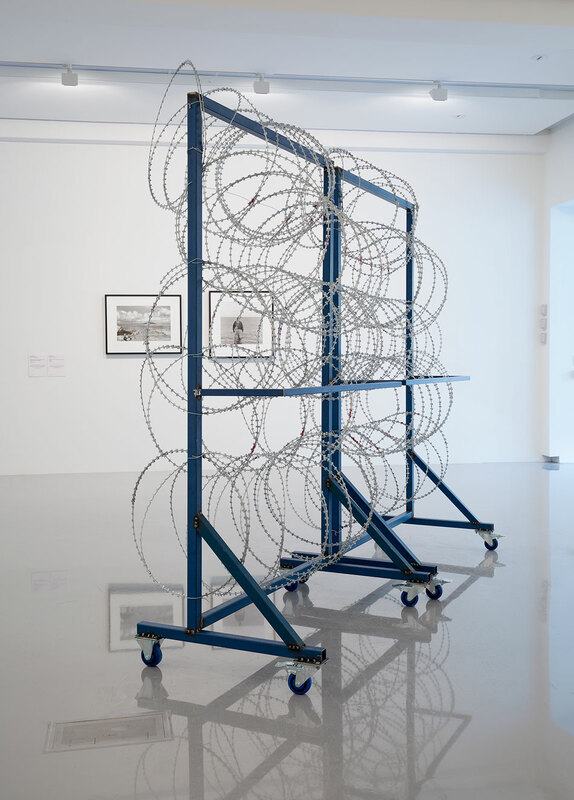 The razor wire fences will continue to be on display, regularly repositioned around the gallery by invigilators based on a score provided by the artists, in the Borders, Barriers, Walls exhibition at MUMA until 2 July 2016.